We are still in the midst of wedding season! But new love songs have come out, so we want to know which ones have been making it to the top of the list. The first dance is one of the reception highlights around making your debut as a married couple. If you didn’t know, a string quartet is the epitome of romance (in our humble opinion) and can make that song sound that much more special than just hearing it the same as it is played on the radio. It is a decent mix of some classics, some brand new, and some that have just stolen our hearts. Look out for the list again at the end of the year to see which ones will continue on! Let us know if you have your eye on one in particular, and we can let you know if we have the arrangement yet! As we say farewell to summer, we want to reflect on our travel journeys and the timeless place that people go for relaxation: the ocean. The sea itself has been a mystical subject for art, especially for string composers. 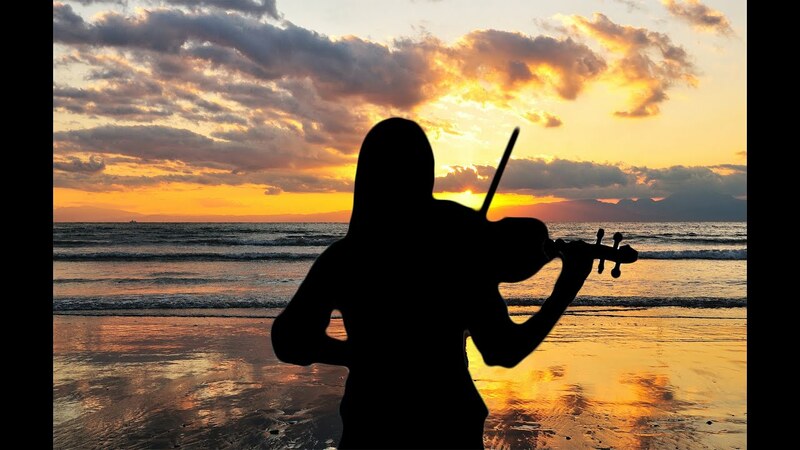 Here are some great orchestral pieces that we enjoy that show appreciation to the vastness of the oceans. “Hornpipe Water Music” by G. F. Handel just emits the feeling of watching the waves roll because of the way the music flows and brings energy, which makes it a classic wedding choice for seating guests and family. “La Mer” by Claude Debussy is a three-piece work for a full symphony that translates from French to mean literally “The Sea.” One of the first debuts of performance was in 1909. Debussy’s goal was for the music to appeal to the senses, which is reflected in the detailed and fullness of the sound that, in turn, reflects the depths of the sea. “Carnival of the Animals” by Camille Saint-Saens boasts two works that feature marine animals. The whole piece is made up of fourteen movements that are amusingly based off a menagerie, and it first premiered in 1886. The first is “Aquarium,” which portrays the mystery that it is to watch fish in an aquarium. The second, “The Swan,” features a rich cello solo that mirrors the delicate movements of a swan. Perhaps you are familiar with the ballet, “Swan Lake.” Swans are water fowl that are no stranger to being subjects of orchestral music. The most famous tune from Pyotr Tchaikovsky’s ballet is the “Dance of the Swans,” which debuted as a whole ballet in 1875. Music surrounding the sea is by no means limited to summer, so the music stays, but we will say farewell to summer until next year! Previously, we were featured in Richmond Weddings’ Vendor Spotlight blog post, which included a profile of our contractor, Nancy. We would like to continue to introduce all of the members of the Belle Arte String Quartet because there is more behind the music stands! This is the second of an ongoing blogpost series. Allow us to introduce this week Brian Evans, a violist in the Belle Arte String Quartet and with the Richmond Symphony. Even though viola is his primary professional instrument, his first instrument was the violin, starting at 13 years of age. So where did the viola come from then? Evans’ story is not unusual for young violinists; the viola has been a common orchestral string instrument essentially since its conception, but because the size is larger than a violin, it can be a bit large for young children first seeking to learn an instrument as well as a lack of available repertoire solely for the viola. Fortunately for Evans, he has the ability to play both viola and violin, as the two instruments are so closely related. Evans took those skills and attended Bob Jones University to receive his Bachelor’s and Master’s degrees in Viola Performance. However, violin and viola are not the only instruments Evans plays; he is skilled at the bodhrán, a special Irish drum, as well as other hand percussion instruments. When he’s not playing music, he is probably out with his wife and four kids, remodeling his house, or he is still playing music with the band at his church. What does he love most about playing with Belle Arte? Nothing is more true to the spirit of the Belle Arte Quartet than that! Where is your ceremony? More often than not there may be guidelines at your ceremony location on what type of musicians and music can be played. ➾For religious locations or a house of worship, your music selections may be restricted to pieces of religious nature (such as no secular songs or even simply hymns). At the very least, you may given certain guidelines as to what music is or is not allowed. ➾For hotels, resorts, country clubs, etc., they almost always have good acoustics in the areas where events are held. Be sure there is enough space for the instrument cases to be out of sight and space for music stands so your musicians can play! Check with the venue coordinator about any music restrictions. ➾For outdoor venues, there are a few more steps to bring in a string quartet, but it is definitely not impossible! Finding an area with level ground and decent weather protection is important for the musicians to be able to perform to the best of their ability. Consider asking the quartet to join in the rehearsal to make sure the sound will carry throughout the space nicely; the instruments are quite capable of being loud enough, but the surrounding space must be compatible for all the guests to hear the beautiful music. For more helpful information, read this previous blog post about having a string quartet be a part of your outdoor wedding or other special event! Belle Arte loves to work with you to pick the right music for each location, and if we don’t have a piece or pieces, we will do everything we can to find it and play it perfectly for your wedding or other special event! This is the first of an ongoing blog post series! So you know you need music in your ceremony, but what are the different parts? Often music is played in the background whenever anyone is walking up and down the aisle. This includes the bridal party, escorting of family members, and even the entrance and exit of guests. Some even choose to have music playing for certain rituals such as the lighting of a unity candle. -Processional: when any and all attendants walk down the aisle, which includes bridesmaids, groomsmen, flower girls, ring bearers, etc. Some pieces of music are fairly long so they can be broken up across different sections of the ceremony, or you can choose a different piece for each section you are including in your ceremony. Please don’t hesitate to ask us about specific pieces or for suggestions, and don’t forget to always communicate exactly how your ceremony is being executed so your musicians can make it as seamless as possible! Thinking ahead to beautiful, warm spring weather? So are we. We would love to make your spring wedding or other special occasion–whether it be at a garden, vineyard, or even a beautiful backyard–come alive. have a rain plain: if it might rain–or it might not, you don’t know–don’t panic. The quartet can still play under a roof, such as a tent or pavilion, so long as the music and the instruments don’t get wet. throw some shade: again, because of the delicate wood, the instruments cannot handle direct sunlight, so find a gazebo, large tree, tent, etc. in the ceremony location for the quartet to play under. Make sure it is close enough that everyone can still hear! Check out our Preferred Vendors on Facebook and Friends of the Belle Arte String Quartet for more, and don’t forget to like us on Facebook for more blogs and updates! Did you know we travel? The Belle Arte String Quartet is based in Richmond, Virginia, and so inevitably you will find us playing usually playing in Richmond. All of our quartet members are either present or past Richmond Symphony members, which gives us a base for our home and for our talent. But that does not mean we won’t step outside of the charming city! If you have a wedding or another event outside of the Richmond area or even outside our helpful venue map, don’t hesitate to inquire! Richmond may be our home, but providing elegant music is our passion. Comments Off on Did you know we travel? February is right around the corner, and if you’re planning an event with music (e.g. wedding, formal occasion, even a proposal? ), you cannot go wrong with the classics–and not just classical music! Chances are, you have seen this tear-jerking story on television, which turns out to be a gum commercial. And we have the music!!! It is a great piece for any part of the ceremony, or even the first dance! Oh, by the way, we’re active on Twitter: follow us @BASQuartet and tweet us your favorite classic love song! We are enthusiastic about the premier of the latest Star Wars episode just as much as you!!! All theories about the plot aside, we are especially excited for new film because of the soundtrack music we get to play it! John Williams, the composer of the Star Wars music, has scored each of the Star Wars episodes as well as composing music for nearly eighty films, including Schindler’s List, Harry Potter, Superman, Jurrasic Park, and the Indiana Jones trilogy. He attended UCLA for composition and later the Julliard School for piano studies. His impressive work for films has earned him five Academy Awards, seventeen Grammys, three Golden Globes, two Emmys and five BAFTA Awards from the British Academy of Film and Television Arts. Williams has also worked on music not just for films but also solely ensembles and even themes for several Summer Olympics. Enjoy the movie and may the force be with you!